“The stowy, Papa!” the sweet poppet reminded her father. 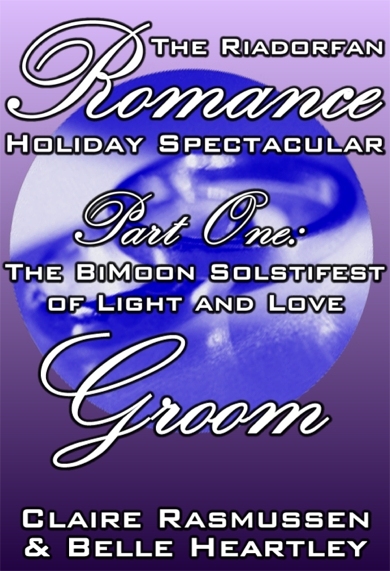 In almost no time at all – merely the time it takes to tell a familiar story to a little girl – Sir Marzipan had explained the origins of Riadorf’s proudest and oldest holiday, the BiMoon Solstifest of Light and Love, which took its origins from a dark time when Riadorf had but two lonely moons, their midnight-blue and pinkish-purple unleavened with the soft light of the silvery-grey orb that joined them later. The people of Riadorf, not knowing the joys that could come of three moons in one sky, celebrated their doubled moons every year with a planetwide BiMoon Solstifest of Light and Love, during which they celebrated their two moons and the principles of light and love, which the adults did mostly by making love under the light of the moons, or else indoors with their lights on if they had allergies or something, and the children did with glowsticks, which have been a favorite toy of children across the Dorgian Galaxy since before the advent of recorded history. One year, as the whole of Riadorf was immersed in an ecstatic – indeed, almost orgiastic – celebration of the BiMoon Solstifest, it happened! A third moon appeared, suddenly and without explanation! And thus, the people of Riadorf knew that their BiMoon Solstifest of Light and Love was truly blessed, for they had been gifted with a third moon, but everyone still called it the BiMoon Solstifest instead of the TriMoon Solstifest because old habits can be as hard to break as the unbreakable web of the Glartanzanion Web-Spider. “All wight, Papa!” tiny Arabesque assented. Sir Marzipan swept his diminutive offspring into an exuberant hug before departing, tossing a friendly smile and wave in the nanny’s direction as he went. Milquetoast Rogers took the friendly smile and wave in the manner in which it was intended – that is, with entirely non-romantic and remote though sincere friendliness as appropriate from an employer to his employee – and sighed, a wistful gust of breath escaping regretfully from between his full bronze lips. While he admired Sir Marzipan’s careful adherence to the Riadorfan Employer-Employee Relationship Appropriateness Policy, he could not but regret that Sir Marzipan could not turn his otherwise keen insight upon the plight of his nanny – for Milquetoast had given his heart to his employer in the instant of their first meeting, much as a Frgui bison of Gwrrk tenderly deposits an offering of saliva into the mouth of its mate. Milquetoast nearly swooned at the compliment, as passed through the lips of this most loveable popsy. “Your father said that?” he exclaimed with a heated exhalation. Forgetting for a moment that the tiny child was only a small young person, Milquetoast clutched his heart and replied, with full sincerity: “Arabesque… there is nothing more that I would love than to become your other father. But how can it be done?” he asked, sincerely. “What’s wrong with my sweater vests?” Milquetoast queried, slightly insulted even though he knew that his pint-sized charge was only being helpful in her own enormously unique and special way, just as a Blortangioi Rapplebob bird so often attempts to repair the nests of its nearest neighbors in a true and earnest spirit of assistance, only to tip the structures over the edges of cliffs, dooming the young of other Rapplebobs to a sudden and plumetous death. Only with sweater vests instead of nests, and feelings instead of fledglings. Perhaps the darling little fartfairy had a point, Milquetoast mused. He did indeed cut a dashing figure in a turtleneck, with his rippling, rock-hard abs displayed nicely by clinging fabric in a way that simply could not be matched by the visual trickery of sweater-vestery softness, no matter how comfortable and practical. Milquetoast readily agreed to the proposed change in activity, and amused his charge for some time thereafter by pretending to converse with her dolls as he served them all tea, much the way a skilled ventriloquist might converse with a puppet, except that dolls don’t usually move their mouths the way puppets do, and ventriloquists don’t usually move their lips when they’re ventriloquating, and Milquetoast did. It was a good thing he was a nanny, and not a ventriloquist. But even as he exchanged pleasantries with Lady Clothface Yarnhair and her daughter and discussed the weather with the dowager Duchess Stuffingbottom, Milquetoast’s thoughts lingered on the wisdom imparted to him by Arabesque. A makeover certainly couldn’t hurt anything – unless his special going-out pair of spayswurm-hide pants was a lot tighter than he remembered – and it might just help Sir Marzipan to realize that he, Milquetoast, had much more to offer than child-minding skills at reasonable rates. It was decided. He would ask the housekeeper to check in on Arabesque after he put her down for her afternoon nap, and he would dash off home to change his clothes. The only thing left to determine was the color of his turtleneck. Blue, or pwink? Er, pink. Sir Marzipan returned from his work on the Former Pirate and now Adventurer Mercenary vessel, the Red Raptor with a spring in his step and a smile in his eye, if eyes could be said to smile, which is rather difficult unless one uses one’s fingers to push them up at both corners. Also, a smile on his lips. The source of all three smiles would be easy to discern, particularly if you had telepathic powers. Had he not that very day bespraggled the corniflating gumpiator of the com holo-view-holo-screen? Had he not hujassened the Gautier beaminatron and fullumpated the Houx 457 (a task of which he had been somewhat wary, being hitherto familiar only with the more common but less decoratative Joux 129)? Had he not, furthermore, been congratulated on his keen grip on the principles of communicative science by none other than Chief Science and Medical Officer Chairite herself? And thus, he smiled – and smiled even more when he stepped inside the threshold of a home so far from humble that it was number nineteen on the Most Ludicrously Lavish list to discern that in the foyer was a beguiling vision of tender manhood, dressed in a tight pair of spayswurm hide trousers that clung to every dimple of his behind and a pink-and-blue vertically striped turtleneck, which displayed the stranger’s back muscles to perfection. The stranger turned, and Sir Marzipan realized, with a jolt of delicious horror, such as one might receive from the Electrified Cookie-Snake of Gelba Seven, that the stranger was no stranger at all! It was his nanny, Milquetoast Rogers! And he looked totally fine! In an instant Sir Marzipan plumbed the hitherto unfathomed depths of his own depravity, for, while he reached for the hallowed principles of the Riadorfan Employer-Employee Relationship Approriateness Policy, as one might stand upon the edge of the bath to reach for something on top of the bathroom cabinet instead of sensibly going to fetch a stool, he felt his metaphorical footing slip, and metaphorically sprawled on the cold tiled floor surrounded by nail polish remover and half-used moisturiser samples. And he rushed past the stunned and gorgeous young nanny to unburden his heart to the one person he was sure would comprehend the horrible mourning these noble words had unleashed within his spirit. Sir Marzipan reeled as if struck. Sweet Proet, that name! That name which had once stirred in him feelings similar to those caused by phrases such as “this convenient and comfortable sitting room chair” and “the usual sandwich for lunch” – feelings of solid dependability and a vague sense of distant, patronizing affection – suddenly moved his heart with a violent passion, as if the eggs of a parasitic Gnitsugsid wasp had hatched within that organ, only more metaphorical, though only slightly less excruciating. Arabesque bounced smartly out of bed and stamped her dainty foot in an adorable display of irritation. “Why?” she demanded! “O, little dumplingdimples. I fear that you will not understand my reasons fully until you are old enough to appreciate the vast wisdom of the Riadorfan Employer-Employee Relationship Approriateness Policy, particularly subsections a-j of chapter thirteen, but, in short, I am ashamed to report that I have developed inappropriate feelings for…for…Milquetoast!” As he spoke this last, Sir Marzipan nearly swooned. Milquetoast made up his mind yet again to take those final, fatal steps outside Sir Marzipan’s grejjian crystal door intricately carved with koiti relief figures, and yet…. And yet, he could not! “There there lovvy,” said the housekeeper, whose tender grey-green eyes had seen many a young man overcome by Sir Marzipan’s rigid honesty. “I daresay Master Marzipan will regret this come the day, seein’ if he won’t!” He offered Milquetoast another capacious handkerchief, into which Milquetoast discharged the contents of his nostrils in a manner both despairing and delicate. Carpetman took both of the younger man’s hands very firmly in his own rough palms. “Go. And. Propose,” he said. Milquetoast sprang to his feet, eyes and nose red no more through the miraculous power of love, and also through the hasty application of cosmetics. “But of course!” he exclaimed, and bounded back through the hall, where he ecstatically tumbled into the pair he loved most. “My heartcushion!” cried Sir Marzipan. “Marry me!” they shouted in unison, and then fell upon each other for a deep and loving kiss. With tongue! “If only you could!” Milquetoast mourned, and felt it incumbent upon him to cheer his true love up by tenderly licking his outer ear, which was remarkably efficacious. And indeed, the very next morning, so shall it was! All the bells of the Red Raptor rang out, as Sir Marzipan Carbonatus wed Milquetoast Rogers, under the capable and audacious hands of Mica’elle Gallo. And everyone watching agreed that this was a beginning as auspicious to another beautiful Riadorfan BiMoon SolstiFest as an excellently-written and romantic story would be in a holiday season collection!